Best Handgun Safes You'll Definitely Want to buy in 2019! Okay, this safe is kind of different from the other safes in this handgun safe list. It’s more of an electronic safe rather than just a combination lock safe for example. This safe also works like a rapid vehicle safe. That product got some fantastic features, usability, and great specs. Yeah, this thing got some less space inside because of the techs to fit in in this small construction, and it’s also a little bit pricy. I think the offerings from this “electronic” handgun safe will be worth buying. Comes with RFID activated wristband, stickers and key fob to instantly open the gun safe hands-free. There is also a 4-digit Keypad (That’s what KP stands for) around the scanner which you can use to have access to the safe. Anti-pry, Child resistant and Tamper-proofing all certified in this rapid safe. You can power this safe with AC power adapter or four AA batteries. This 14-gauge steel construction with multiple lug nuts makes this safe nearly impossible to unlock for a thief. Well, it is 100% guaranteed, but a thief will have a hard time with this safe. 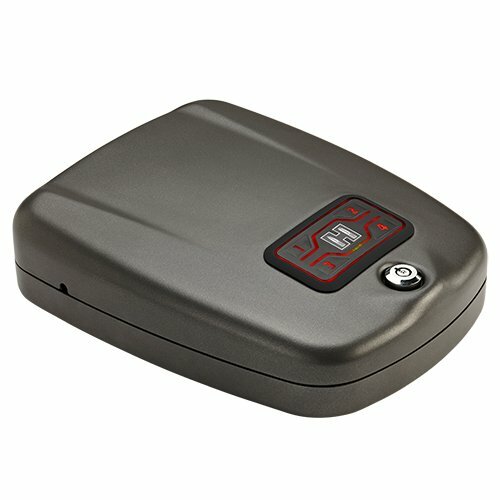 Setting up all the unlocking accessories is super easy, and one activated item can be used to unlock multiple Hornady safes with RFID support. All you need to do is the program to work. And of course the foam padding. A lot of features right? Yes, this safe does all those things and does it pretty well. I know most of the people won’t use all the features, but you know having more is way better than having less for not a massive amount of money. Let’s see why you should buy this safe why not by a short pro-con list. The safe delivers excellent quality and smart features. It is undoubtedly the best small gun safe. If you can spend a few more than a regular “non-electric” safe, this safe by Hornady might be an excellent choice for you. It is an Amazon brand item. 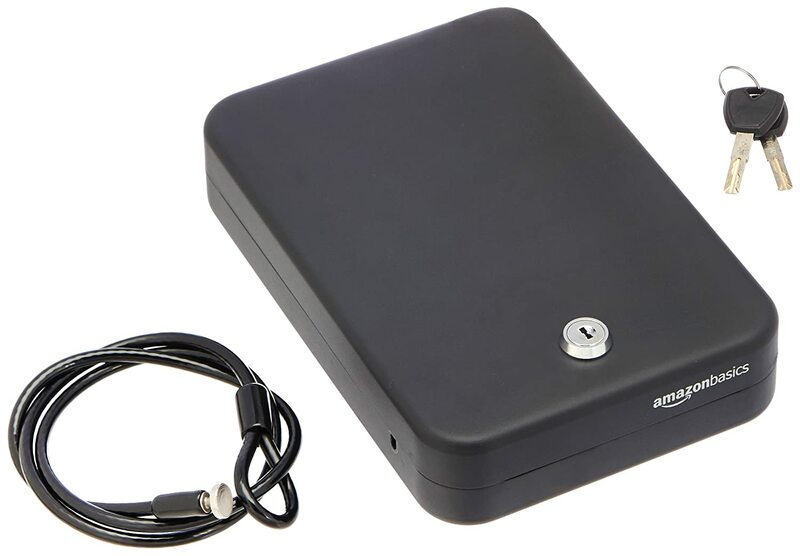 It is a super portable safe which is small as well as durable along with some nice features. To keep a single firearm with one or two magazines, it is perfect sized safe. You can also store cash, jewelry, and any small valuable items in this safe without worrying about your children tampering with it. You can use this safe as a home safe and keep it in a closet, or you can also take it somewhere safe if you need to. The steel-built quality is on point, and it has a critical robust locking system. It is not very secure, but considering the purpose of using the safe, it’s something to think twice. Let’s see at a glance what this safe can deliver. The Amazon Basics SW-SK01 is built with pry-resistant steel and has a compact design. It has a built-in zinc alloy to increase security, combo lock the cable is of 1700 pounds-tested steel which is a beautiful thing. This safe features top and bottom padding of foam to make sure your valuables take no damage and stay intact. The safe weighs only 3 pounds. It can be easily fit into luggage for being very small and lightweight. It can be used at home, office or in a car, anywhere you prefer. 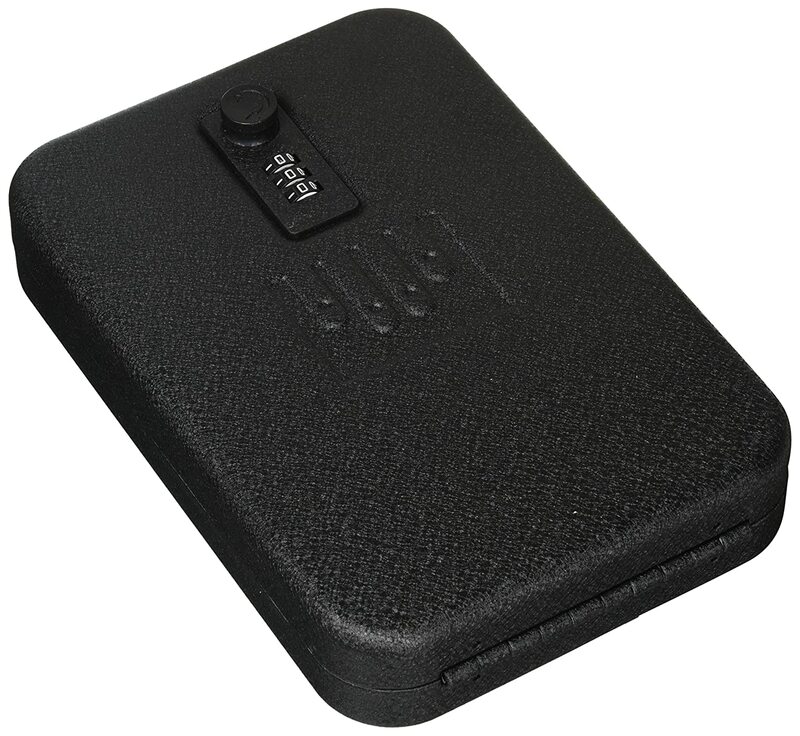 That means this small handgun safe can be useful for various purposes. The quality of the safe is of course mind-blowing. I mean, you get a ton of features in such a compact package. This safe is also so much cheap that it can surely beat any other safes in this price point. Honestly speaking, price combined with the aspect of this safe made it the Number 2 spot in this list. Before making any final choice, you know what to do right? Look for the “pros-cons” section down below. Do you need a cheap and high-quality safe which should be easily transportable? This safe is precise according to your needs. Go for it. The safe provides excellent value. This safe is definitely worth the money. It is an interesting one. You know 1911 pistols are longer than most other handguns and this safe is called “1911 style”. And that’s because it fits a 1911 gun with a mag too. That means the safe is a bit larger compared to the other handgun safes and also weights a bit heavier. There are three number dials for the combination lock, and it’s effortless to configure and operate. On the inside of the safe, it has a 1/2″ thick top and bottom foam padding to keep your gun or other material protected from any damage. It blocks unauthorized access to the safe after some base attempts. The top and bottom halves nicely fit together without any gap. The security cable is tough enough, and it is tested and rated for 1500 Lb. Which is amazing. The safe is genuinely lovely and sturdy. It is a very affordable safe. Well, the safe may lack some of the high-tech features like fingerprint and lighting and stuff. But be sure, those safes will take double your money but may not provide double the value. The safe is attractive, and we spent a decent amount of time with the safe to review this. Yes, this safe is not perfect. Nothing is perfect in this world. Everything has some drawbacks except 1911 handgun, it’s perfect, right? Anyways, this Gun Vault NV300 may not be the best handgun safe, but it is undoubtedly best at itself and the things it does. This safe is almost identical to the previous one. Again, all these safes are for handguns for most of the people that’s why all of them are similar without some functionality, dimension, weight and steel thickness. The Champs Safe is mostly recommended for travel use for its portability. That doesn’t mean you can’t use it at home. No, you absolutely can. Despite putting guns in it, you can also put cash, credit cards, passports or your secret girlfriend’s photograph. Hey, it’s a multi-purpose safe okay? Use the way you want to use and this safe will provide you with top-notch security for sure. This safe is a combination locking safe with three digits and knob to lock and unlock. On the outside, the safe looks very well designed and sturdy. So let’s jump into the features section. The Champs Portable Travel Gun Safe is good at most of the things of a handgun safe. Before recommending it to buy right away, I am going to take you to the pro-con section, and after that, you’ll be able to judge this safe. Let’s find out if the safe is worth your money or not. 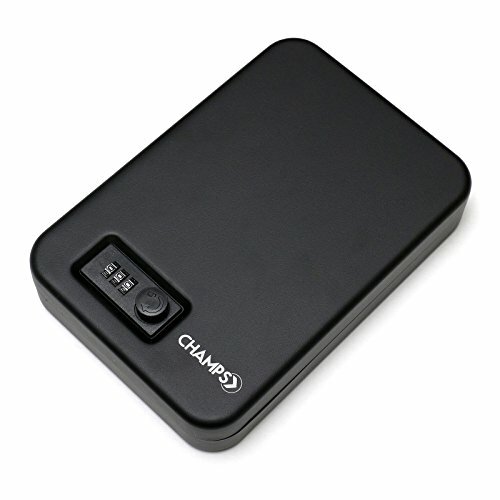 Champs Portable Travel Gun Safe is a real travel handgun safe. It is such a great deal in a small form factor. The safe has minor problems which will occur to someone rarely. When it comes to buying a small pistol safe, the first thing that happens in mind is that it should not only deliver great security but also should be cheap. 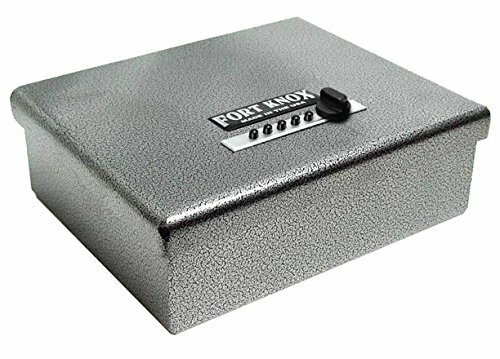 Well, I am not saying that this Fort Knox model is that cheap, but what this safe can provide will amaze you. So let’s check the features. This safe is a uni-body manufactured safe with 10-gauge steel and has an inviolable spiral door. It comes with a gas-strut to assist lifting and holding the heavy door. The push button is very smooth, and very quickly it opens the safe. It also has the mechanical locking keys to use 1081 different combinations. On the outside, the safe seems sturdy and high quality. Thanks to the antique silver coat finishing on the surface to create that kind of look to the safe. The elements seem pretty nice, and it has the heavy steel built with mechanical locking tech. It weights a little bit heavy though. The safe feels strong enough to keep your valuables untouched inside it. Now combining everything together, there is no doubt that it is a quality product. But, does that make it the best handgun safe? Before making any final decision let’s see the pros-cons of the safe. The bottom line is the safe has fantastic features. There are a lot of things in this safe, and that includes heavy-duty steel, mechanical locking, beautiful design and a lot more. We reviewed this safe physically and can assure you that you won’t regret buying this gun safe. Though it has some drawbacks, those aren’t a deal breaker for most of the people. So there you have it, the most beautiful handgun safe or a pistol safe per se, in the market right now. You know we also reviewed Fort Knox FTK-PN which is also a nice one. While buying a handgun safe or a pistol safe you will always want to buy the best one for you. No matter what save you buy from the list or from anywhere else. The thing matters, is what the safe provides you with. Handgun safes should be very small in size as well as lightweight. You don’t need a gigantic safe just to keep just one pistol. The safes can also be used as vehicle gun storages. That means this kind of safes are compact safes. These storage boxes are very small to store more than one pistol with one or two spare mags. This is the perfect size for most of the people. In some cases, people can’t store a 1911 sized gun inside a safe. I think you should avoid those type of safes. To make sure if your gun fits in the safe you want to buy, ask the seller on Amazon before buying. That will save your money from wasting into a small sized safe. These safes should provide you with minimal security to protect from children travelling for most of the cases. If you have a burglar attack, it is not impossible for them to break into these small safes although they will have a hard time with the safes. Handgun safes must be enough durable to keep the inside items intact. A great thickness to the steel, pry resistance, tamper proofing and inside foam paddings are some of the most important things that makes a safe durable. Most of the safes of this category have Key lock, combination lock and electric locking mechanism. In this department, locking should not be complex and overkill. I think key lock and combination lock both are the perfect systems for a compact safe. Nothing fancy is necessary there. The overall price should not be that much cheap to provide you with plastics and low security. On the other hand, the price should not be also that much expensive. A ton of features and bigger sizes and heavyweight are unnecessary for pistol safes. Pistol safes must be compacts and should not be overwhelmed with features. Let’s say you might find a great handgun safe for you under 300. To wrap up the handgun safe reviews, I can say that these 5 safes are the best in the market right now. All of them are for very similar kinds of needs. You can buy any of those products mentioned in this review. Check the prices and find which is suitable for you and if you have any questions regarding these safes or any other gun safe related queries, don’t hesitate to leave a comment below.